Although spring is considered the queen among seasons for flowers, autumn just as plentiful and beautiful when it comes to berries and blossoms. Whether you’re looking for a bouquet to send to a loved one or a centerpiece for your dining room table, one of the best ways to incorporate fall into your flowery designs is right outside your door: pumpkins. Up to 69% of Americans report that the smell and sight of flowers improve their mood. The very color and shape of a pumpkin can not only increase the vibrancy of bouquet, but it can invoke the very essence of the entire season. But how can you incorporate pumpkins with your flowers? 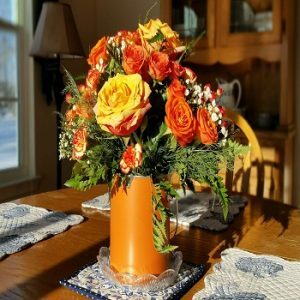 Depending on how long you want your centerpiece to last, it may be a good idea to consider using either a craft pumpkin and cutting it into a vase or simply using an uncut pumpkin. This is because pumpkins are vegetables and, once cut, typically succumb to dehydration within a few days and begin to look, well… spooky. One of the best ways to use an uncut pumpkin in your centerpiece is by surrounding it with tall and short candles in deep, rich reds and purples or whites for a softer, more feminine look. Then compliment the pumpkin’s color by incorporating bouquets of dahlias, mums, and pansies from your local florist in Northern VA. The candles and flowers turn the pumpkin from a kid’s favorite art project into an elegant, autumn masterpiece. If you want a more functional centerpiece that’s just as beautiful but allows guests to pass food along without ruining your flowers, consider using smaller pumpkins such as tiny gourdes and surround a bouquet of chrysanthemums and poms from your local florist. The scene will be just as colorful and elegant but does well in smaller spaces. Love the pumpkin but not the color? Paint your pumpkin an accent color or even gold to make it blend in with your home’s color scheme while keeping to the season. For those who prefer the look of a pumpkin vase to a pumpkin centerpiece, cut and carve your pumpkin as you would any other, but without the face (unless you’re really feeling it). Then gingerly place a container of water into the pumpkin to supply water and nutrients for your bouquet. Consider asking your florist for roses, poms, lilies, and possibly some sprigs to help crowd the pumpkin and keep it balanced as well as colorful. Your pumpkin vase should last up to seven days. Fall is a great time to celebrate nature and what better way to do that than with flowers from your local florist in Northern VA? For more autumn floral arrangements to decorate your home, contact Open Blooms today.